After months of playing Pink Panda remixes in his Sirius XM show, StoneBridge started to get curious and just before the yearly Amsterdam Dance Event conference, Pink Panda reached out and a meeting was set up. 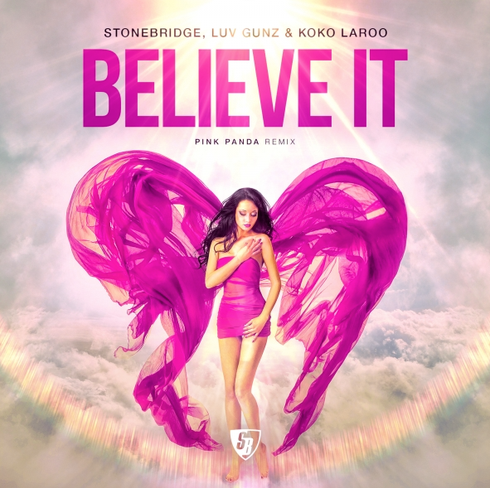 Not long after, the boys delivered a rework of StoneBridge, Luv Grunz & Koko LaRoo’s 'Believe It’, which has just been released. The original mixes of ‘Believe It’ streamed over 100,000 plays on Spotify in the first week and was featured in several playlists like Fresh EDM and Digster Dancefloor as well as apparently scoring high on both the UK and Swedish club charts. This new mix may well be likely to follow with its big room feel. Arriving on the scene three years ago, Pink Panda have been focused as they raised their profile via their production releases and DJ sets. Now signed to Cr2 Records, they are a trio of producers and DJs. In human form they are Ardell Mafi, Rob Porter and Michael Cassiano, who together have been delivering their own style of big room, progressive, electro music which has garnered support from DJs such as Tom Swoon, Dannic and Max Vangeli to name a few.